Cooking all day on Thanksgiving can take all the joy right out of it. That is, unless you're like me and LOVE cooking! So here's the deal: for all of you that either don't want to cook, or just don't have the skill set, LET ME HANDLE IT FOR YOU! I'll ship the meal right to your doorstep, all you do is heat and serve! 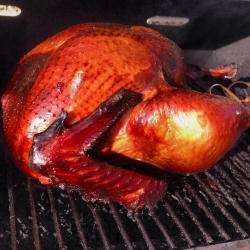 - Turkey - 12-14 lb turkey (feeds 8), honey brined and mesquite smoked, your choice of whole bird or hand-carved. I've got a limited supply available, and these go fast. I've already sold about 20% of what I've got available this year. Make Thanksgiving EASY this year - MESSAGE ME TO PLACE YOUR ORDER NOW! *Deliver fee will be added to all deliveries outside our delivery zone.